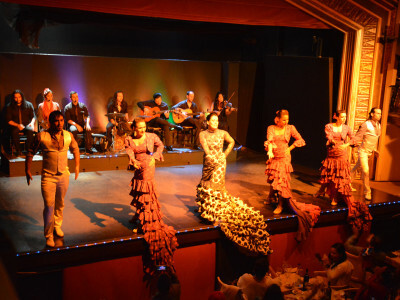 The beautiful flamenco art form, which combines unique music and dance to create a breathtaking audiovisual experience, is famous throughout the world. On your hen do in Barcelona you can experience the raw power of flamenco with a professional show at a flamenco night, while enjoying an amazing three course Spanish meal. At the show you will be amazed by the way the professional dancers and guitarists use music, movement and melody to paint a beautiful show. Many dancers and guitarists practice their whole life to learn the art form which comes from Andalusia in the south of Spain, and the flamenco dancers in Barcelona are among some of the world’s finest. To fit with the traditional theme, you will enjoy an amazing three course Spanish meal, which echoes the feel of the flamenco show. With drinks provided, incredible food and performers of an impeccable quality, get ready for an unforgettable experience.